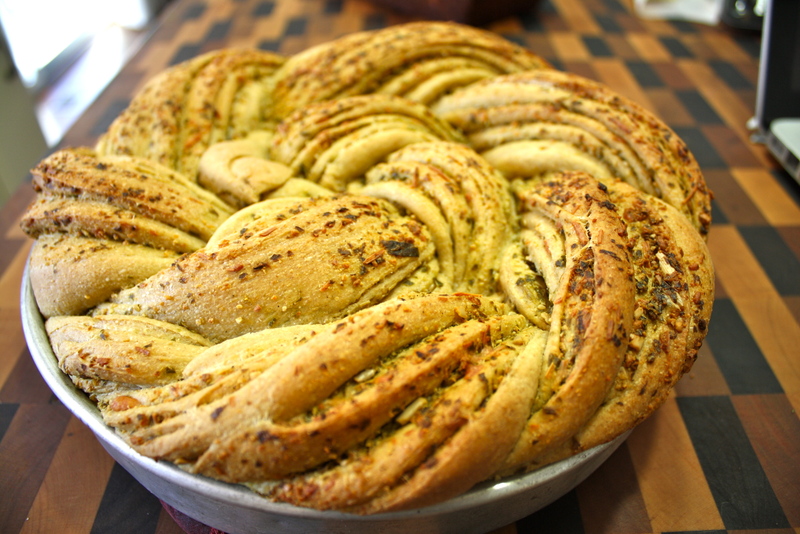 When I first heard about braided breads, I was still a timid bread maker and thought that it would be too difficult. Since those days I have tried my hand at a few different kinds of yeast breads and found that it is actually quite easy. I decided to try and make the bread a little healthier by using whole wheat flour for 1/2 of the flour called for in the recipe. Modern whole wheat performs beautifully. 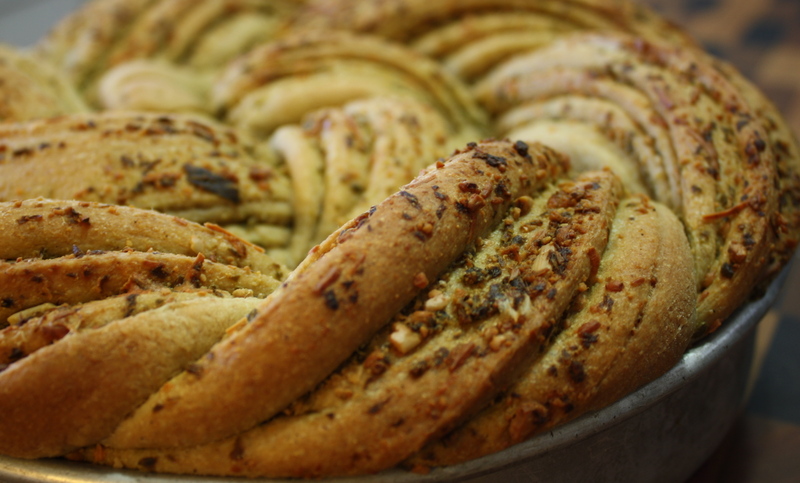 No more worries that you will end up with a dough too heavy for delicate baking. I make my own pesto from the basil I grow in my back yard every year. I freeze numerous 1/2 pint containers of fresh basil processed with olive oil and a little lemon juice. I can then use it for pesto and any other dish needing some fresh basil flavor. You can use a commercially prepared sauce as well. When my family gathers for Thanksgiving, Wednesday night is soup night at the hosting household. We all arrive at different times and soup is easy to keep ready. Everybody brings something. My oldest son will be bringing his chili. I will bring two loaves of this bread. 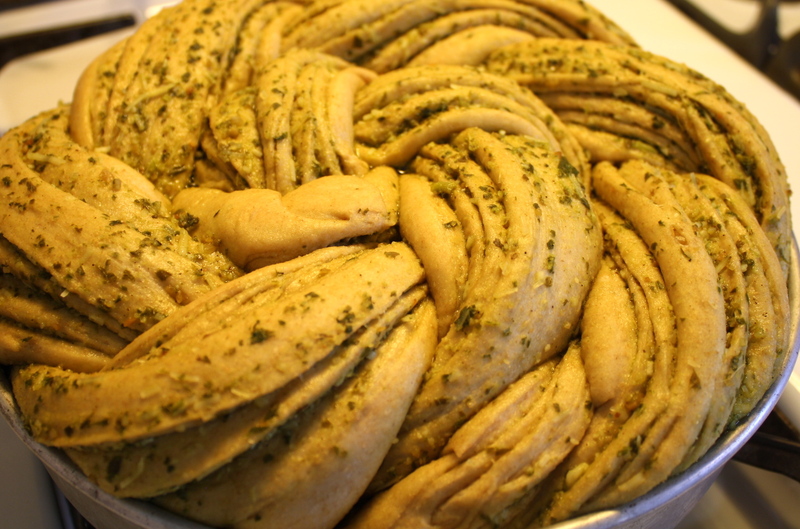 The following recipe is for one braid. It is as delicious as it is beautiful. In the bowl of your stand mixer, put all of your unbleached flour and 1 cup of the whole wheat. Add the yeast, sugar and salt. Using hot tap water, combine water and oil and mix. Attach paddle to mixer and turn on low, add water/oil to dry ingredients and mix until well combined. Switch to the dough hook and start adding the remaining flour in small increments watching so see that it incorporates. Scrap down the sides of the bowl often. Your want a soft dough that is just past being sticky…just barely. This will take about 5 minutes. Turn your dough ball into a greased bowl and turn to coat. Cover and set in a warm spot to rise until about double in size. Punch down the dough and turn out onto a floured work surface. 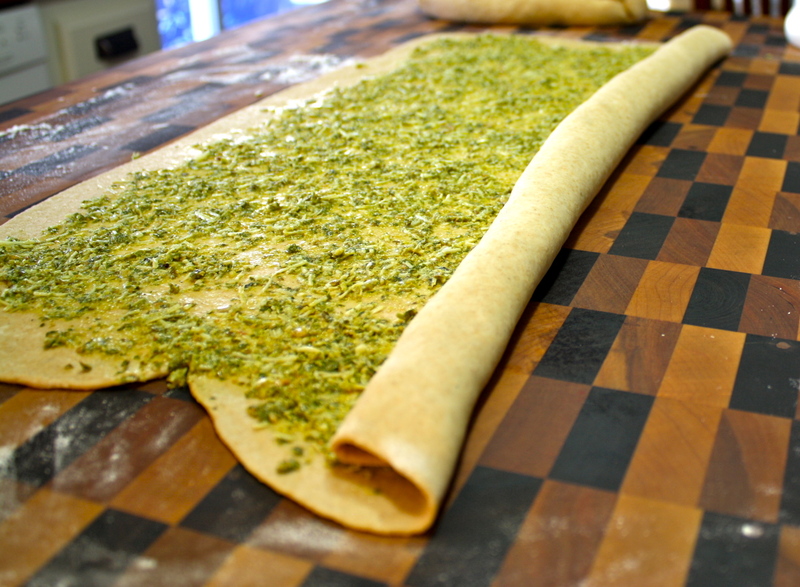 Shape the dough into a long tube, a little over 12 inches long. 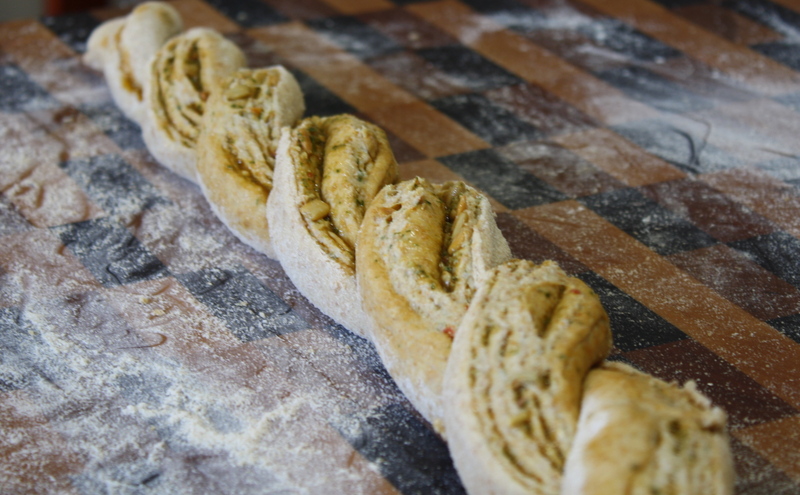 Using a rolling pin, roll dough out into a rectangular shape until the dough is very thin, as thin as you can (1/4-1/2 inch). 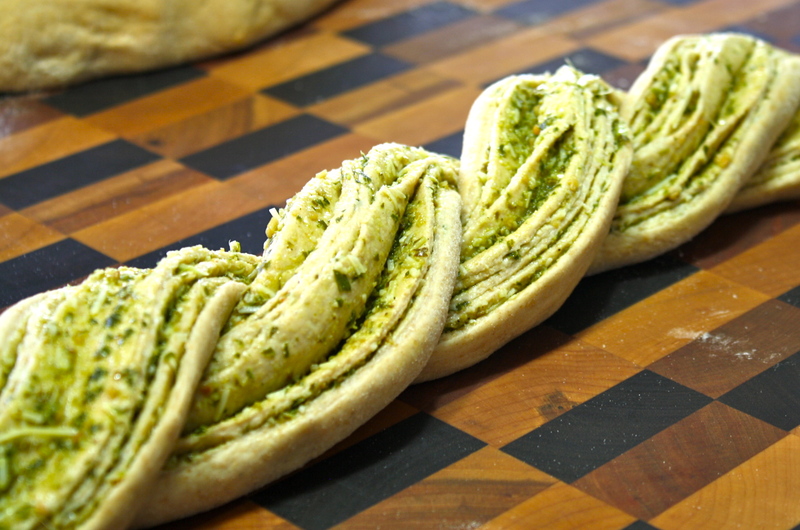 Spread the pesto in a thin layer over the dough leaving one of the longer sides with a space about an inch wide. 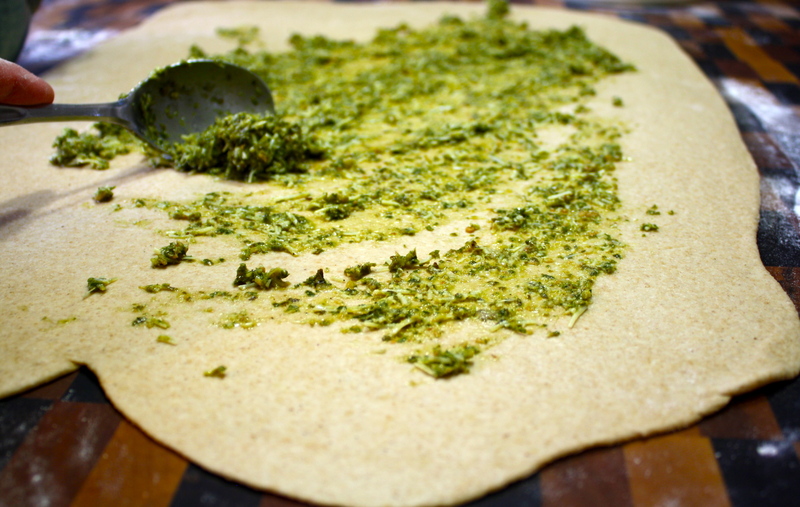 From the opposite long side, begin to roll the dough into a log. 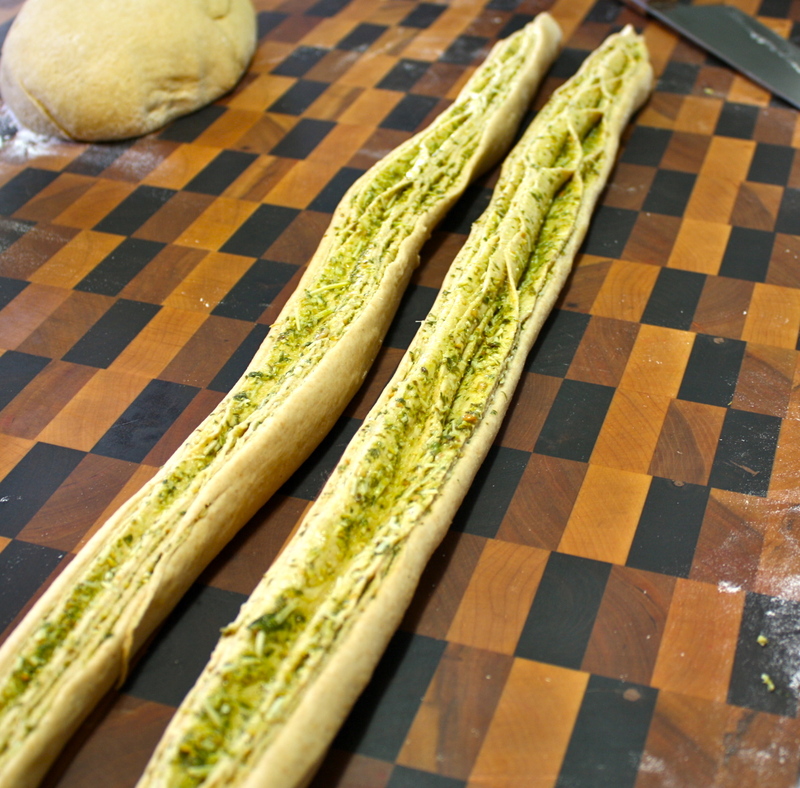 Using a chef’s knife or dough scraper, cut the log into lengthwise so you have two long pieces. Pinch the top ends together and then twist the two pieces together keeping the cut edge facing up. Pinch the bottom ends together. 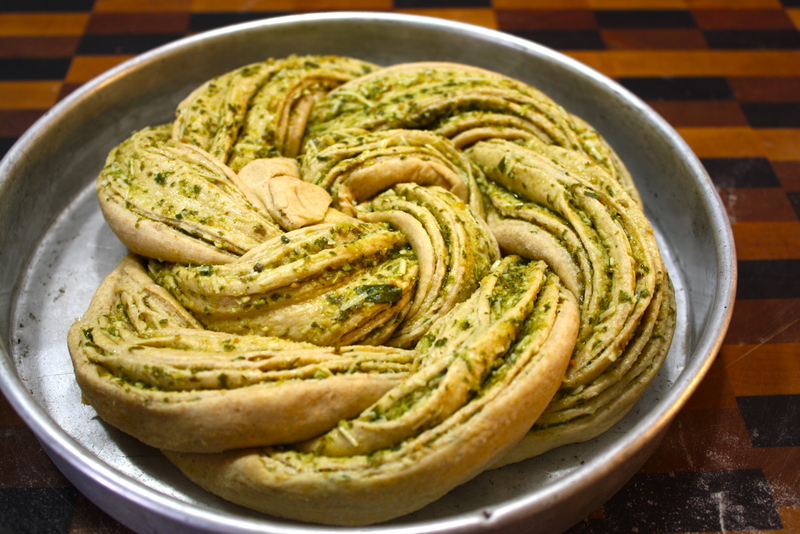 Using a greased spring-form pan base, a cake or pie pan, take the dough at whichever end seems smaller and begin to coil the braid around in the pan and tuck the end under. If using spring-form, attach the side ring. Cover and let rise again until almost double. Bake for 10 minutes and then reduce temperature to 350F and continue to bake for another 25 minutes or until bread is golden brown. Remove and allow to cool. Enjoy with your favorite meal! Thanks, but its really is not that hard to do. I’m the proof! Your bread looks so fancy but you make it so easy! I also love the idea of freezing prepared basil. I used to have a huge basil that I couldn’t keep up with I was forever given basil away and making pesto. Wow, this looks SO good! I am a timid bread maker and have not yet ventured into yeast breads. But this I want to try! I also make my own homemade pesto, and I have some in my freezer so I will plan to make this soon. This looks delicious! Great way to make soup a proper meal. wow! I’m impressed! Look fantastic!